Warning device KOMKON USOPP is intended for showing of two yellow twoside blinking signals. They inform about approaching to the uncontrolled pedestrian crossing both the drivers and the pedestrians at night and twilight time. 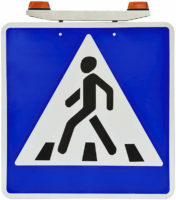 The device is installed over the sign «Pedestrian crossing». Device includes two LED lights with transparent covers, and the terminal box between them. Box has the control device inside, that controls lights and allows to control LD brightnes according to the exterior light.